(Characters words) “This is how I’ll always remember you, surrounded by winter, forever young, forever beautiful. Rest well my love, the monster who took you from me will soon learn that revenge is a dish......best served cold”. When a villain makes a first appearance saying something as sensational as that, then you know right away that he’s going to be awesome. When it comes to famous comic book villains there’s plenty of great one’s like the Joker, Doctor Octopus, Lex Luthor, Venom, Dr. Doom and my personal favorite, Magneto. But why doesn’t anyone ever acknowledge Mr. Freeze? 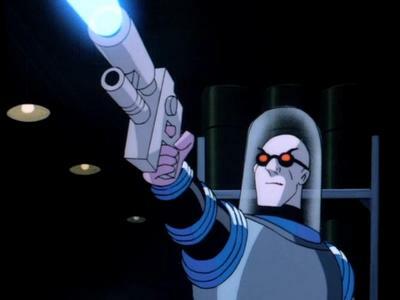 He’s cold-hearted, and is forever trapped inside a suit that keeps his body temperature below freezing, surprisingly having a gun that freezes things makes him come off as a cool gun-slinger. I honestly think he’s the greatest of Batman’s enemies, not just because he looks cool and has a nifty gun but because he’s the most complex, sophisticated and tragic. So why does Mr. Freeze always get the shaft, well let’s take a look it his media legacy and see if we can find an answer. As always it’s best to start at the beginning and it’s clear that he wasn’t that complex at first. The 1960’s animated TV show referred to him as “An Ice cream man from Mars” which isn’t the least bit intimidating. In the 1960s live action Batman television series, Mr. 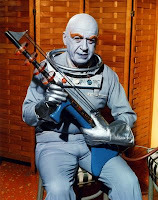 Freeze was played by three different actors, George Sanders, Otto Preminger and Eli Wallach. All three looked pretty silly but then again it was 60’s television and George Sanders at least gives his usual classy performance. 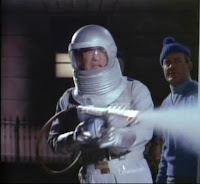 The George Sanders version wore the classic refrigerated suit while the Otto Preminger and Eli Wallach versions wore a "Freeze Collar" around their neck. Despite not being that intimidating, I was still plenty disappointed that Mr. Freeze wasn’t in the 1966 film “Batman The Movie”, I mean that was the biggest collection of Batman villains on film and it would have been the perfect (and only appropriate)opportunity to see him amongst all the other classic villains. Anyway, this version of Mr. Freeze is nothing spectacular but it’s worth mentioning simply on the grounds of this being the first time the character appears in live action. 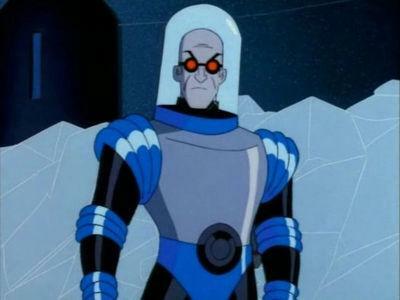 Then there was the 90’s animated Batman show which recreated the character and is responsible for creating his tragic back story about his frozen wife. This is where I really found the character the most interesting, tragic and whenever I think of Mr. 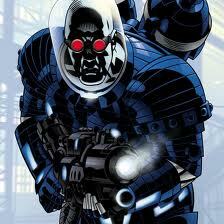 Freeze, the first image that always comes to mind is him in this TV show. His appearance in the series was designed by “Hellboy” creator Mike Mignola and holly cow is it an awesome design, it’s not over the top and is given just the right touch of both subtlety and menace. Another big highlight is voice actor Michael Ansara. His voice is so firkin awesome and his performance is so genuine and effective. I especially love how he delivers these awesome lines, there just so cryptic and tragic all at once. (Batman) “To satisfy your vengeance, you would take away innocent lives?” (Mr. Freeze) “Think of it Batman, to never again walk on a summers day with a hot wind in your face and a warm hand to hold, oh yes, I would kill for that”. He also gets away with saying other really sinister lines like "The cold eyes of vengeance are upon you," and "Prepare for the icy touch of death." 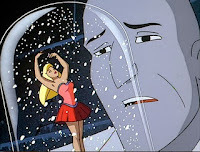 His introduction episode titled “Heart of Ice” is often regarded as one of the best episodes of the series and even won an Emmy Award for Outstanding Writing in an Animated Program. By TV show standards, it’s a really dark and complex back story with a relatively emotional tone. Actually, comparing Mr. Freezes unfortunate background with Bruce Wayne’s makes it look like Batman got it easy. His parents are dead, Bruce can morn them and move on, but Mr. 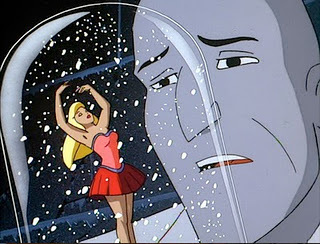 Freeze isn’t so lucky. His wife isn’t dead, she’s stuck in a form of limbo where the possibility of life is still there but Freeze loses his chance to save her every time. He can neither morn her death or save her life and the one thing that makes his heart so cold isn’t hatred or greed, its hope! This back story was so good that just about every variation of the character uses it. The imagery is great, it’s the kind of serial imagery fans love to see in Batman stories. The music is also very effective and really gives life to the episodes surreal atmosphere. It’s just a very solid episode, here Freeze is more than just an awesome villain with a cool gun, he’s a tragic character write out of a Shakespeare drama. The dialog is so sophisticated that the episode is practically righting itself and the final spoken words from Freeze really get you to sympathize with the character. “I failed you, I wish there were another way for me to say it......but I cannot. I can only beg your forgiveness and pray you hear me somehow, someplace, where a warm hand waits for mine”. 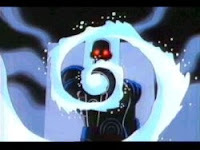 Freeze would be seen in latter episodes like “Deep Freeze” which continued his story very well. A latter episode titled “Cold Comfort” completely changed him, he’s no longer a frozen victim in a refrigeration suit, now his mutation has destroyed most of his body and all that’s left is his head that movies around on manacle spider legs. How on earth did Mr. 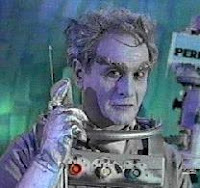 Freeze get reduced to this, the character was just fine before but now he’s become Dr. Loveless from “Wild, Wild West”. He’s still plenty intimidating but he just seems to have lost the same sophisticated evil that was present in his earlier appearances. 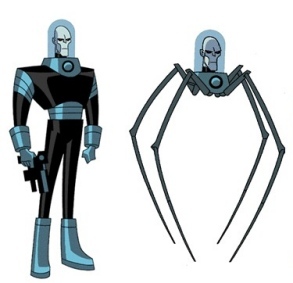 This story arch continued in the fallowing TV show “Batman Beyond” where he also gets a new suit and design. The story may not be that impressive but it’s still plenty entertaining and it’s great that Michael Ansara continued to do the voice work. 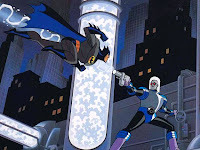 There would be different portrayals of the character in future shows like “Batman the Brave and the Bold” and “Young Justice” but one that really stands out is his portrayal in the 2004 TV show “The Batman”. Now he’s voiced by Clancy Brown and is extremely menacing. Sure there’s no longer anything dark or tragic about him and his design looks fare more monstrous then classic but he’s still pretty awesome and had many episodes in the shows run. In 1998 there was the animated direct to video movie titled “Batman and Mr. 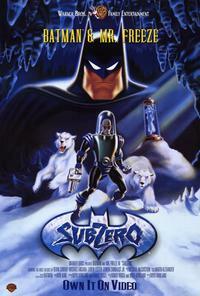 Freeze: Subzero”. 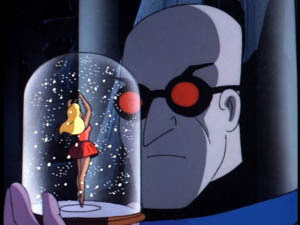 This is definitely the best thing to happen to the character sense his first “Heart of Ice” episode and the story takes place during the animated Batman TV series before the events of the “Cold Comfort” episode. Once again he’s a menacing villain but he still has a certain sense of honor and dignity to him. In the end he becomes a better man and one that Batman feels sympathy for, which is great because it’s not often that a hero and villain can come to a respected understanding. While the film did a good job with Mr. 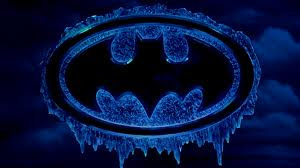 Freezes character, the story is still nothing special and Batman is hardly in it, in fact he doesn’t even see Freeze till the very end of the film where they have a very brief fight. They got the internal conflicts down just fine but I would still like a good external conflict with Batman involved. Mr. Freeze makes a small cameo in the animated DVD movie “Superman/Batman: Public Enemies”. 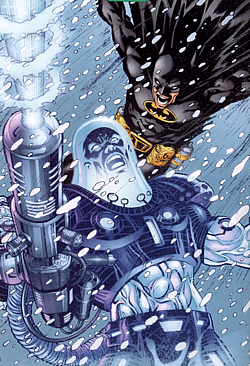 He's seen with the other cold warriors like Icicle II, Killer Frost, and Captain Cold when they are among many other villains trying to claim the bounty on Superman and Batman. After a brief fight with Batman, they are all defeated by Superman's heat vision. It may not have been that big but it was still nice to see him in another animated Batman movie. Now of cores I need to mention Arnold Schwarzenegger’s portrayal of Mr. 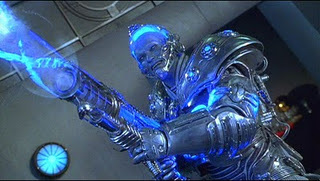 Freeze in the 1997 theatrical movie “Batman and Robin”. First of all, it’s such an odd casting choice, personally I think that Tom Hardy or Patrick Stewart would have been the perfect actors to bring the character to life. To be fare, this film does keep the tragic back story of his frozen wife and there is one or two note worthy moments, especially his change of heart scene at the end. But they just weren’t enough to excuse everything else, like his non-stop puns and dancing around to a sing-along tape of “I’m Mr. White Christmas, I’m Mr. Snow”. The costume is also a bit over the top, it’s actually a cool design on paper but in the film he looks a lot like a big glowing action figure, there’s just nothing subtle about it. He even has his own signature battle vehicle that looks like it belongs in an old adventure serial. I know it’s hard to take a guy in a freezing suit seriously but this is the big reason that Mr. Freeze constantly get’s the shaft. It was his first and to date, only theatrical movie appearance and it turned out to be a huge disappointment to fans and now no-one feels safe using him in another motion picture. I understand that this portrayal was a fluke but that doesn’t mean the character should be completely abandoned. The best villains are those born of tragedy, similar to the way Batman was born from horrific events and there’s so much potential for this character to have a truly sophisticated, dramatic and intense appearance in a theatrical Batman film. Any character (fact or fiction) deserves a second chance and I really hope writers of future Batman movies will allow Mr. Freeze to make a proper comeback in a motion picture film. But for now, it seems that the character will literally be put on ice. "It would move me to tears......if I still had tears to shed."